The wind may have taken a little while to cooperate on the opening day of the 2019 FORSA Bonaire PWA World Cup, but eventually, the breeze returned during the mid-afternoon to allow the first round of the Men’s and Women’s Single Eliminations to be completed. The action which followed was explosive as the world's best freestylers took full advantage of the world class on offer, but not only were massive moves thrown down, but there was also a few massive upsets along the way! Just the first two heats of the Women’s Single Elimination were completed on the evening of the opening day. Italian Francesca Floris produced a confident performance to defeat Jazzy Zwerus (JP / NeilPryde) in Heat 10a, before Poland’s Julia Pakosz sailed excellently to take down local girl Angela Koch. Julian Wiemar (Starboard / Severne) claimed an impressive victory against Antoine Albert (Goya Windsurfing) in the opening heat of the contest to book his place in the top 16. The 21-year-old combined the latest power moves and combinations to progress and will now face Jacopo Testa (RRD / RRD Sails / AL360) in the next round. The Italian faced a late scare against the young upcoming talent of Corto Dumond (Starboard / Severne), but the New Caledonian’s shaka-flaka wasn’t quite enough as he lost out to Testa by just 2 points. The fireworks exploded in Heat 2a as Davy Scheffers (Tabou / GA Sails) went blow-for-blow with Bonairean Youp Schmit (I-99 / Avanti). At one point the two sailors almost collided with Schmit carving downwind for a one-handed ponch just in front of Scheffers, who was mid double e-slider. Luckily they avoided each other. In the end Schmit came out on top with a trademark shuvit spock and a sick spock into one-handed ponch inflicting some of the damage. Next up Schmit will face fellow Bonairean - Amado Vrieswijk (JP / Severne), who successfully dispatched of 15-year-old - Lennart Neubauer (Starboard / Severne / Maui Ultra Fins). Taty Frans (Point-7) became the next home grown hero to progress into the top 16 as he defeated Balz Müller (MB-Boards / Severne) in Heat 3a, before former world champion - Dieter van der Eyken (Severne / Severne Sails) - produced a clinical performance to dispatch of Max Rowe (Simmer / Simmer Sails) - Frans and van der Eyken will now go head-to-head in the round of 16. Giovanni Passani (Tabou / GA Sails) produced the first real upset of the day in Heat 4a as the Italian claimed a narrow victory over teammate - Antony Ruenes (Tabou / GA Sails). In fact by the end of the heat there was just 1 point separating the two sailors - crucially for Passani that was in his favour. Heat 4b saw the matchup of the first round as vice-world champion - Adrien Bosson (Fanatic / Duotone / Maui Ultra Fins) - was drawn against former world champion and current event champion - Kiri Thode (Severne / Severne Sails) and the action didn’t disappoint with both sailors producing explosive performances, which saw the lead continually changing hands. However, it was Bosson who eventually progressed as the 27-year-old survived a stern test. The level was so high that Bosson and Thode set the two highest scores of the day at that point - 127.7 & 127.07 points. Francesco Cappuzzo (RRD / RRD Sails / AL360) faced Jamie Howard (F2 / F2) in the first round and the Italian successfully navigated his way past the Brit with a late kabikuchi sealing the deal. Cappuzzo will now face a tough test against Steven Van Broeckhoven (Starboard / Gun Sails) after the Belgian produced the highest scoring heat of the day - 131 points - against Takuma Sugi (Tabou / GA Sails). On his way to victory Van Broeckhoven landed a variety of moves but the pick of the bunch was a new combination - a shaka-spock. In Heat 6a - Nicolas Akgazciyan (JP / NeilPryde) - made the perfect start as the Frenchman produced a polished performance to eliminate Riccardo Marca (Fanatic / Duotone), who sailed welled below par. The Italian will now have to look forward to the double elimination to try and stage a comeback. Meanwhile, in Heat 6b - Yentel Cabers (I-99 / Point-7) - looked to be in fine form as he ended the hopes of Aaron Etmon (Starboard / S2Maui) - with a combination of old school moves and the latest power combinations. Heat 7a saw another incredibly close heat between Mattia Fabrizi (Patrik / Sailloft Hamburg) and Loick Spicher (RRD / RRD Sails) and in the end there was just a point separating the two sailors. Spicher made the brighter start, but Fabrizi battled back by the end to set an intense finish. However, Spicher sealed the deal as he landed a kabikuchi in the dying seconds to advance. The Swiss will now face Sam Esteve (JP / NeilPryde) in the next round after the young Frenchman produced a late fight back against Adam Sims (Patrik / Sailloft Hamburg). For a long time it looked as though Esteve would be crashing out early after sailing below par for much of the heat, but luckily he escaped this time around. The penultimate heat of the day saw Nic Hibdige (Tabou / GA Sails) take on local hero Tonky Frans and the young Brit, who used to live here, produced the best performance of his career so far to take down Tonky. The 23-year-old was on fire throughout as he inflicted telling blows with kabikuchis, a no-handed culo and a super tweaked shuvit spock to deservedly progress. 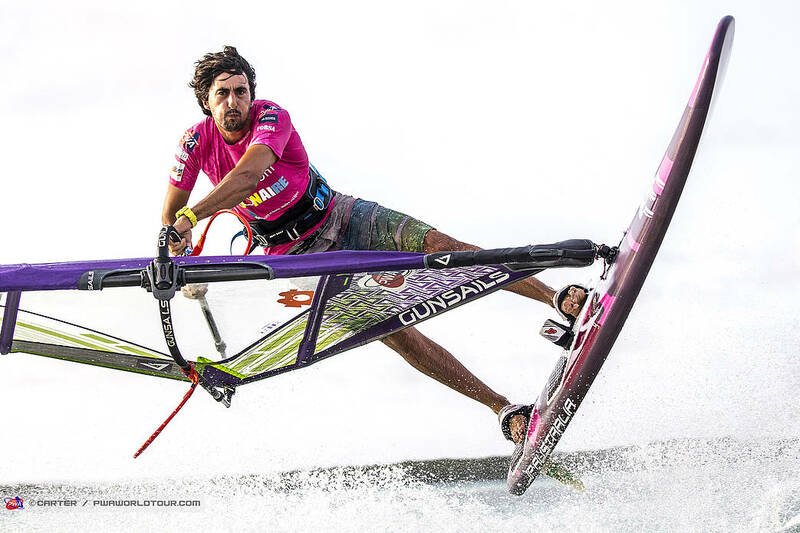 Hibdige will now lineup against Julian Mas (JP / Gun Sails) after the Frenchman not only produced the biggest shock of the day, but also one of the biggest upsets in recent years, by defeating 9-time world champion - Gollito Estredo (Fanatic / Duotone) - in the first round. The Venezuelan certainly didn’t sail a bad heat, but just met a sailor who came out with all guns firing, and seemingly being able to pull off almost any move he wanted today - which included landing a new combination - flaka into bob. Mas was understandably delighted after claiming the biggest scalp of his career, while Gollito now faces a mammoth task to salvage anything from the event. However, with 9-world titles you definitely wouldn’t bet against him doing just that! There’s another promising looking forecast for Wednesday and the sailors will meet again at 8am tomorrow morning for the skippers’ meeting with the action commencing from 8:15am (GMT-4) onwards.